LOST DUTCHMAN SEARCH first opened its doors in 1985 at a location on Lost Dutchman Drive in Scottsdale, Arizona. The street was named in honor of what is probably the most famous “lost” mine in the United States. The office windows faced the beautiful Superstition Mountains in the distance and according to legend, the location of the Lost Dutchman Mine is generally believed to be somewhere in those, appropriately named, Superstition Mountains, Apache Junction, Arizona. The mine was named after a German/Dutch immigrant miner who discovered the mine in the 19th century and who kept its exact location a secret, even to his passing. Each year people set out to search for the mine, some never return. GO FOR THE GOLD … with Lost Dutchman Search! Our motto: “Mining for Talent in the Insurance Industry” speaks to our direction and dedication in the searching out and placement of exceptional insurance candidates. We are proud of our reputation and our strong presence within the insurance marketplace. We are veteran insurance recruiters, members in good standing, in the largest, insurance specific, recruiter’s association in the US: National Insurance Recruiter’s Association (NIRA). NIRA membership has grown to over 98 insurance specific recruiting firms. When we accept a search assignment from a company or work with a blue-chip candidate prospect we actually have the resources and assistance of the entire NIRA membership available to us. The recruiters at Lost Dutchman Search work nationwide and are dedicated to the search and placement of Insurance Professionals. We offer contingency, exclusive and retained search options. Our placements are usually direct hires. We have a history of success in the carrier, MGA, MGU, broker and agency marketplace. Our recruitment and placement success includes: Claims, Accounting, Actuarial, Underwriting, IT, Loss Control, Call Center, Human Resources, Legal, Tax, Compliance, Audit, Marketing, Sales, Product Management, Operations and Executive. WE ARE HEADHUNTERS! 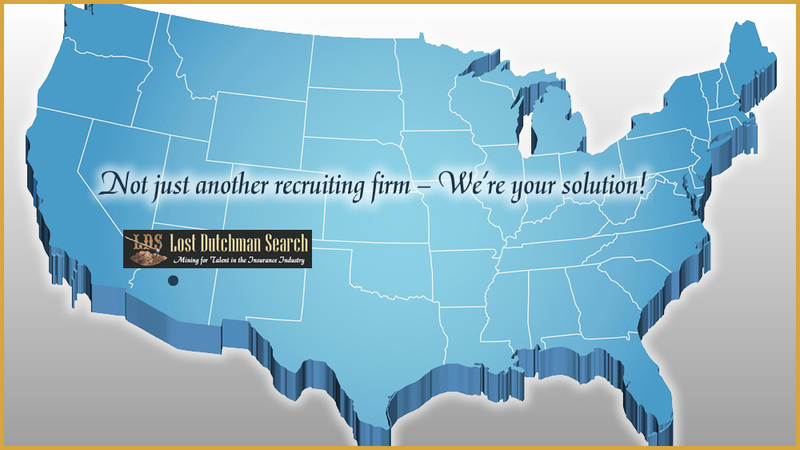 Lost Dutchman Search is a national insurance search/recruiting firm working to search out and fill insurance positions in Alabama, Alaska, Arizona , Arkansas, California, Colorado, Connecticut, Delaware, Florida, Georgia, Hawaii, Idaho, Illinois, Indiana, Iowa, Kansas, Kentucky, Louisiana, Maine, Maryland, Massachusetts, Michigan, Minnesota, Mississippi, Missouri, Montana, Nebraska, Nevada, New Hampshire, New Jersey, New Mexico, New York, North Carolina, North Dakota, Ohio, Oklahoma, Oregon, Pennsylvania, Rhode Island, South Carolina, South Dakota, Tennessee, Texas, Utah, Vermont, Virginia, Washington, West Virginia, Wisconsin, and Wyoming. Connect with one of our recruiters today! Email recruiter@lostdutchmansearch.com or call 480-563-7676. Our recruiting contractors are dedicated exclusively to serving the recruitment and placement needs of insurance carriers, brokers, MGA's, TPA's, MGU's and agencies both nationally and internationally. Lost Dutchman Search is a registered trademark and is protected by the US Patent and Trademark Office under registration number 3,211,806.